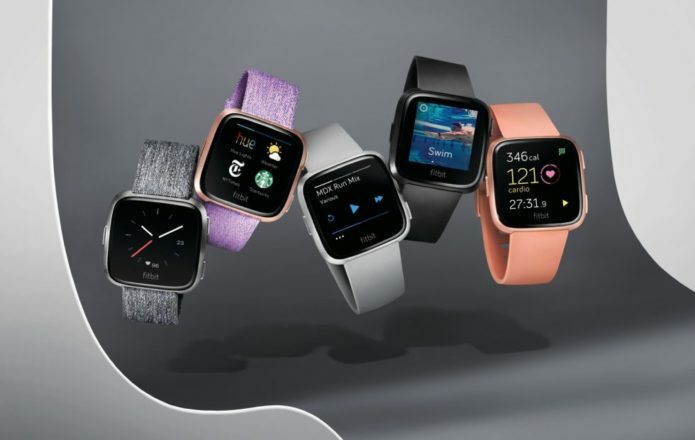 Fitbit has pulled up its sleeve and revealed its latest smartwatch, the Fitbit Versa, a metal-bodied wearable with more than a few hints of Pebble to it. Dubbed the lightest metal smartwatch in the US, the Versa not only introduces new Fitbit hardware but the latest version of the company’s OS for wearables. That’s Fitbit OS 2.0, and it promises a number of new features. For example, there’s now a more straightforward dashboard view on the watch, showing the highlights of health and fitness data. Daily and weekly health and fitness stats – including heart rate and exercise summaries – are also included. The Versa itself is made of anodized aluminum, with a rounded-square shape topped with a color touchscreen. Fitbit says it’s 1,000 nits brightness, too, for outdoor visibility. It has 24/7 heart rate monitoring, along with Bluetooth for phone-free music playback. Onboard storage can save up to 300 tracks locally, but there’s also support for Pandora favorite stations and custom or curated playlists from Flow from Deezer. Fitbit Pay support is included, on the Fitbit Versa Special Edition only, supporting a selection of MasterCard, Visa, and American Express cards. Fitbit says its mobile payment service is now supported by almost 40 banks across 14 countries, though more are due to arrive this year. For the moment, you can get app, call, calendar, and text notifications from an iOS, Android, or Windows device on the Versa’s display. In an upcoming update to the Android app, Fitbit says, you’ll also be able to send replies to texts and messenger IMs. There’s also third-party app support, including Hue lights control, Nest, Starbucks, Yelp, and more. Still, while there are more than 550 apps and clock faces in the Fitbit App Gallery, the company says that not all of them are compatible with Versa yet. Later in 2018, meanwhile, Fitbit says Fitbit OS will get more personalized. It’ll be able to show reminders, celebrations, insights, sleep summaries, and social challenges, along with prompts to take action, all based on your own personal use. A new female health tracking system is also included on Versa. That allows easier logging of the menstrual cycle – including support for recording headaches, acne, cramps, and other symptoms – with dynamic prediction of your upcoming cycle. That data is also integrated with other health metrics, like sleep and weight trends, and Fitbit says it eventually hopes to add more personalized insights and guidance around how all the factors interplay. The Fitbit Versa will be offered in a number of finishes, and with a selection of interchangeable bands. The body itself will be offered in stainless steel, charcoal black, and rose gold. Bands, meanwhile, will include stainless steel links and mesh, Horween Leather in cognac brown, midnight blue, lavender, and saddle, and swim-ready fabric in peach, gray, black, periwinkle, and white. Presales of the Versa will kick off tomorrow online, priced at $199.95 for black with a black aluminum case, gray with a silver aluminum case, or peach with a rose gold aluminum case. The Fitbit Versa Special Edition, the only model with NFC for Fitbit Pay, will be $229.95. As for accessories, they range from $29.95 to $99.95.